Blockade of PD-1 in combination with INK128 inhibits liver cancer cell proliferation and clone formation in vitro in immunocompetent mice. (A) Representative pictures show the clone formation of different administered groups in SMMC7721 PD-1 OE cells. (B) Histogram showing mean number of cloned formed 6 SD in each group. P < 0.05. (C) Optical density values 6 SD of Cell Counting Kit 8 assay in different administered groups in SMMC7721 PD-1 OE cells. (D,E) Flow-cytometric assessment of cell death with percent of annexin V1/7-aminoactinomycin D1 cells, mean 6 SEM. (F,G) Tumor growth kinetics (mean±SD) of different administered groups versus corresponding control in C57BL/6 mice subcutaneously implanted with PD-1 OE or vector-control Hepa1-6 cells. *P < 0.5; **P < 0.01; ***P < 0.001; #, not significant. Abbreviations: 7-AAD, 7-aminoactinomycin D; CCK8, Cell Counting Kit 8; NS, not significant; OD, optical density. Hepatology, 2017, 66(6):1920-1933. Sapanisertib (INK 128, MLN0128,TAK-228) purchased from Selleck. 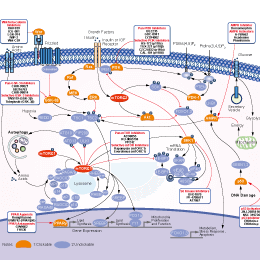 Hep-2 (D) or SCC-9 (E) cells were treated with PI3K/Akt and mTOR dual inhibitor LY 294002 (LY, 1 umol/L), mTORC1 inhibitor rapamycin (0.5 umol/L), mTORC1/2 dual inhibitor AZD2014 (0.1 uM), INK-128 (0.1 uM) or AZD8055 (0.1 uM) for 72 h, cell viability was analyzed. The mean of three independent experiments performed in triplicate was shown. Statistical significance was analyzed by ANOVA. *p < 0.01 vs Control. **p < 0.01 vs. AZD8055 group. Biochem Biophys Res Commun 2013 440(4), 701-6. Sapanisertib (INK 128, MLN0128,TAK-228) purchased from Selleck. (A–C), BMDMs were pretreated with or without INK128 (10, 20, or 30 nM) for 1 h and primed with LPS for 3 h. The cells were then stimulated with or without ATP. (A) Western blot analysis of IL-1β and cleaved caspase-1 in the supernatants and western blot analysis of NLRP3, pro-caspase-1 and pro-IL-1β in the lysates. Acta Biochim Biophys Sin (Shanghai), 2018, doi: 10.1093/abbs/gmy088. Sapanisertib (INK 128, MLN0128,TAK-228) purchased from Selleck. Antonino Maria Spart from University of Bologn. Sapanisertib (INK 128, MLN0128,TAK-228) purchased from Selleck. Bone marrow derived macrophages were pre-treated with 1nM INK128 for 1h prior to LPS treatment (100 ng/ml). TNF-a production was analyzed 24h later. Sapanisertib (INK 128, MLN0128,TAK-228) purchased from Selleck. Liu A, et al. 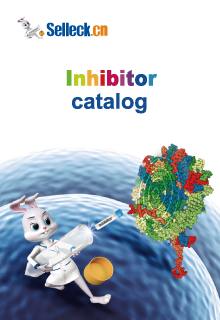 Drug Discovery Today: Therapeutic Strategies. 2009, 6(2), 47-55. Jessen K, et al. Mol Cancer Ther. 2009, 8(12), Meeting Abstract Supplement. Hsieh AC, et al. Nature. 2012, 485(7396), 55-61. What is the recommendation method to formulate S2811 INK 128 (MLN0128) for oral administration? You can try this vehicle for oral administration: 30% PEG400+0.5% Tween80 +5% Propylene glycol.